Hi Toni Newman here and welcome to another episode of the Innovation Advantage Podcast series. Podcasts that show you how to use customer experience innovation to drive more customers, more revenue and more growth in your business. And if you have ever wondered if it’s okay to share a personal story on your business social media channels, then this episode is for you. Look, there’s no doubt that social media is a great touchpoint opportunity. A place to create innovative customer experiences that differentiate you from your competition and remind customers why you. But as the world become smaller, and the audiences we can reach become larger, it seems to me that sometimes personal can be a little too personal. In fact, sometimes I am completely blown away but what entrepreneurs and other professionals post on their business social media channels. Oh… and just for the record, if you are in business and your clients, suppliers or even your colleagues follow you on your personal pages, those personal pages ARE business pages. Personally, I have no issue with being personal. After all, one of the S’s in my Five ‘S’ Solution is the ‘S’ for Seductive and one of the ways to make a customer experience more seductive is to make it more personal. 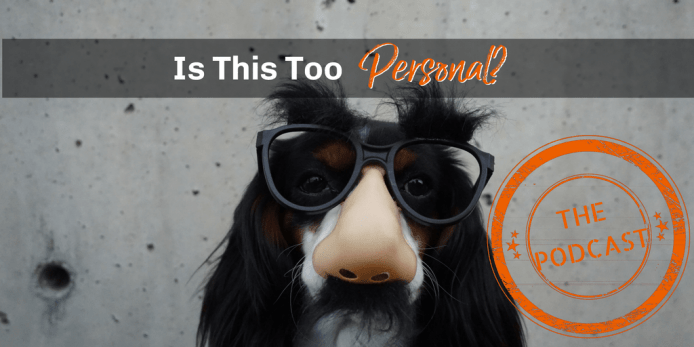 Yes – personal for your customers but revealing your own personal side can be pretty seductive too. For example, when I started out in business I was a single mom with two small children and I often turned down work if it interfered with my family responsibilities. My clients knew that my family came – and to this day still does come – first and sharing that side of my personal life actually attracted more clients who were a better fit for my business model. But one of the other S’s is Strategic and that means that every experience we create – no matter how seductive – also needs to deliver value for our customers because then – and only then – does the personal story or experience become a vehicle that helps you drive home your message and support your brand promise. So whether it’s blogs or tweets, videos or podcasts Instagram or Snapchat – today I would like to share with you the 3 circumstances that I believe justify sharing a personal experience on a business social media channel. #1 : The story triggers an emotional impression that you want associated with your brand. Sharing a personal experience that triggers an emotion can be a powerful thing – as long as you trigger an emotion that you actually want associated with your brand. You see I believe that stories create emotional impressions. Think of those impressions like a footprint in the sand or the imprint of a baby’s hand in clay. Each one of these emotional impressions is added to the other emotional impressions that your customers have of your brand leaving them with an overall sense about who you are and what you stand for that they may or may not be able to clearly express. It’s just a feeling. So Let’s say you go on a humanitarian trip with your family overseas, and you share the stories on your business social media channel. The emotional impression triggered by those stories are probably going to strengthen your customers’ connection with your brand. They will see you as a good person, a giving person, a person who helps out those who are less fortunate and those are all great emotions to have associated with your brand. They seem to use their hectic lives and impressive client lists as some kind of badge of honour And frankly for me, I’m not sure whether they are complaining or bragging, neither of which are emotional impressions that I would want associated with my brand. So, before you “post” your next personal parable, ask yourself, a) what emotional impressions could this story trigger and b) are those emotional impressions ones that you would want associated with your brand? Stories anchor learning and your readers will be grateful when you share your knowledge and valuable lessons with them. Using a personal story to share a lesson that enriches your customer’s lives is always a great idea. Years ago I wrote a very personal article about my step-mother’s journey through the final stages of Alzheimer’s. The article was entitled Truth is What you Make It and it dealt with the evolution of my perceived truths about who I believed my step-mother to be. The blog generated more comments and feedback than any other that I have ever written and inspired many readers to re-examine their own feelings of loss and forgiveness. However, I think the greatest gift of that blog, was the lesson that it contained about courage. About having the courage to challenge what we believe to be true and to not allow our perceived truths to stand in the way of the gifts that life has to offer. Not only was this a powerful life lesson but it was also strategically aligned with innovation and having the courage to let go of what might be standing in our way. So before you announce your next personal anecdote, ask yourself, a) does this story share a lesson that enriches the lives of your readers and b) is it a lesson that is strategically aligned with your brand. #3 : The story provides social proof of your ability to deliver on your brand promise. Essentially, any personal experience shared in a business context should help your readers discover or re-discover something about you that reinforces their perception of your ability to deliver on your brand promise. For example, I have a colleague who speaks and consults on prosperity shows pictures of an expensive sports car on their website and shares pictures of his extravagant world travels on his business channels, these personal experiences provide social proof of his ability to deliver on his brand promise. They prove that he is capable of creating prosperity. So, before you tweet your next personal tale, ask yourself, a) what will my readers discover or re-discover about you or your business that will enhance their perception of your ability to deliver on your brand promise? So… Is telling personal stories on your business channels a great way to connect with your customers? teaches a valuable lesson that enriches the lives of your followers or provides social proof of your ability to deliver on your brand promise… it’s probably best left on your personal social media pages. What do you think? Do you agree? Have I missed anything? I would love for you to go the comments section below and share your thoughts on when you think it’s appropriate or inappropriate to share personal experiences on a business social media channel. Please share as much as you would like because remember, the more we share, the more we learn and the more we learn, the more we grow. And as always, I invite you to head over toninewman.com and check out the Innovation Advantage blog where you will find more videos as well as articles, podcasts and downloadable resources that can help you grow your business. And while you’re there, make sure to subscribe to our email list and become an Innovation Advantage Insider. You will get our Innovation advantage Insider’s report with our best content– tips, techniques and tutorials that will help you drive more customers, more revenue and more growth in your business. Thank you so much for dropping by. I appreciate your time and I look forward to catching up with you on the next episode of the Innovation Advantage podcast series but until then, remember that sometimes personal can be too personal and Imagine the possibilities!